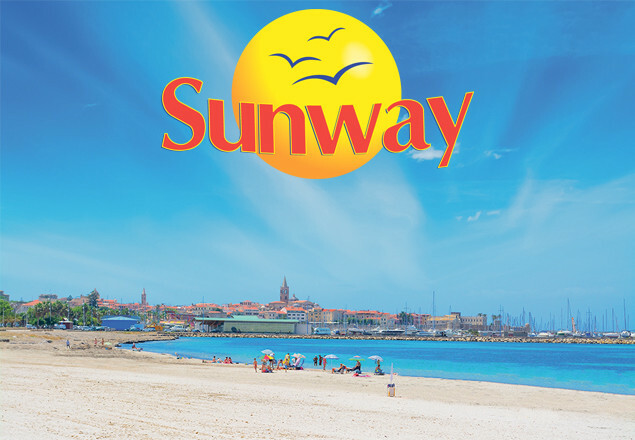 This week with Rewarding Times and Sunway you can enjoy a 7 night Sardinia holiday at the San Marco Hotel, Alghero, Sardinia for two people including flights, accommodation, transfers, travel insurance, one dinner for two with wine, Neptune Caves Tour and Inside Sardinia Tour. Price: €1,530 for two, was €1,962 - Save: €432. Sardinia is one of the largest islands in the Mediterranean - second only to Sicily. An ancient land full of cultural, environmental and folkloristic riches makes it a fascinating island. With more than 1800km of coastline comprised of glorious beaches and delightful coves, it has successfully escaped mass tourism and still holds on to it’s own individuality and charm. Alghero is a picturesque walled small city on the north-western corner of the island. You will find yourself seduced by its laid back charm and the amazing white powdery sandy beach of Maria Pia only a 5 minute drive away. On arrival to Alghero airport, direct from Dublin, you will be met at the airport by a Sunway representative and transferred by coach to the San Marco hotel located just 20 minutes away. A welcome meeting will be arranged to advise you on all your resort has to offer. Dinner in the San Marco Hotel with a bottle of wine included. Stroll along the beach front to the charming city with its narrow pave and cobbled walkways opening into small piazzas with its trattorias, pizzerias, bars and shops. Join us on this half day tour as we leave Alghero and head south along the winding scenic coastal road. The views of the surrounding countryside and Mediterranean Sea are simply spectacular. While in Bosa you can taste the fragrant Malvasia di Bosa, a rich amber coloured wine. Day 5: Boat Trip to Neptune Caves. Nobody should holiday in Alghero without a trip to the beautiful Neptune’s Grotto or “Grotta di Nettuno,” Located at the far side of the beautiful 186m headland at the end of the Gulf of Alghero, and named Capo Caccia, or Frontuni as it is known by the locals. The caves are without doubt the most beautiful and well known in Sardinia. Trip lasts approx. 3 hours. Offer includes Return flights from Dublin to Alghero, return transfers, travel insurance for two people for duration of trip, 7 nights’ accommodation in the 3* San Marco Hotel, Alghero, one dinner for two with wine, Neptune Caves Tour for two people and Inside Sardinia Tour for two people. 10 rooms available for this offer. Once you have received your voucher, please contact Sunway, with your voucher number, address and passport details no later than Friday July 14th 2017.